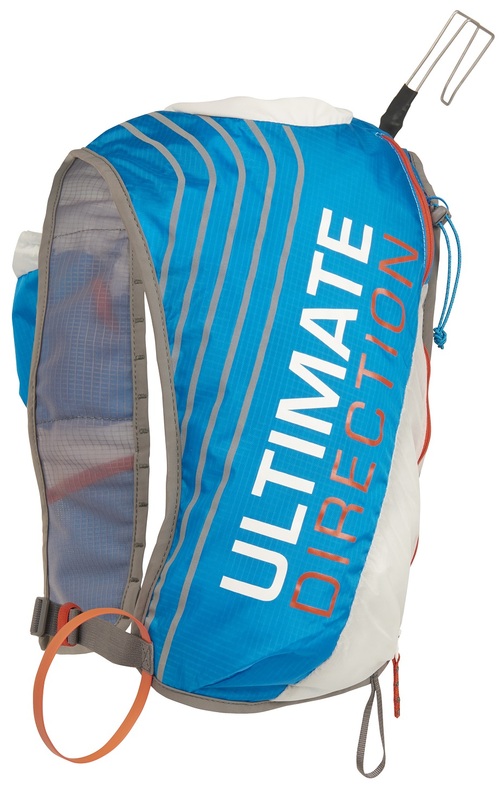 If you’ve spent sleepless nights thinking about minimalist skimo packs (like Ultimate Direction did), you will end up designing the Skimo 8. At just 8 liters, the trail-inspired racing vest is the fastest way to fly. Weighing next to nothing and hugging you like a daughter, the “eight” might as well not even be on your back. But if you’re forced to carry a few items (see race checklist) or might need to put your skis on your back while out for a quick training lap, the Skimo 8 is the perfect companion. 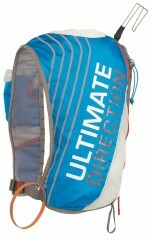 The vest-style pack is UD’s specialty, and it offers a fit and stability unlike a more traditional sack. With simple-yet-effective ski carry, shovel/probe hooks, and hydration options, this vest is the most useful arrangement of featherweight rip-stop nylon you’ll ever have. 100 denier triple rip-stop nylon is amazingly durable for its weight. Front storage has room for a flask, gel, and even a light snack. Full-length side zip on the back accesses cords to hold avy gear. Quick-carry ski hook is removable for more summer storage. Ice axe loop and bungee for speed missions on spring mornings. Internal security pocket takes special care of important items. Comes in multiple sizes and even has a safety whistle. * Measure your chest with your clothes on. Round up if you plan on packing the vest full. I've used this for a few races. As mentioned before you need to buy a race specific shovel and probe. I've been fitting the ATK race shovel, and ARVA carbon light probe. But anything larger simply will not fit. 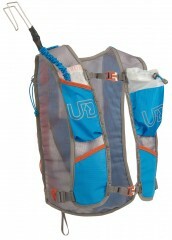 To meet the additional race requirements you'll need very packable upper body and leg layers. The ski attachment loop is surprisingly hard to get the ski tails into. Not sure if this is a personal problem, but it is noticeably worse than other race packs I've used. I'm a huge fan of the pockets on the shoulder straps (following the running vest theme), salomon soft flasks, shot blocks, etc. fit nicely. 80% of my days are spent wearing this pack. For short, simple days in predictable weather this thing is unbeatable. I can carry my shovel, probe, headlamp, compact puffy or wind layer, overmitts, slope meter, a few ski straps, 20oz of water, and a few hundred calories all in this pack. Since my skiing is generally quick and easy, this pack does just that. It obviously does have its limitations though...but it's an 8 liter ski pack, that's somewhat expected. Like Eric mentioned, a compact probe and fairly small shovel blade are necessary. The big question I get from a lot of people is "Can you even fit a REAL shovel in there?". The answer is yes, kind of. The blade and handle of my Mammut Allugator sits safely inside next to the probe. Bottom line: For multiple laps, quick missions, and flat out racing you can't get a whole lot better than this. Hey Josh, most compact probes (8-fold) will fit in there just fine. My ARVA Carbon 240 Compact fits in there perfectly. The Camp Crest shovel is the only shovel I have found that will fit inside the pack. I tour with this pack pretty regularly (it's awesome) and in order to carry a real shovel I put the blade inside the pack and use the ice ax holder for the shovel handle. It's not ideal but it works. A few things worth noting for this pack. It was built purely with racing mind so it is not my first choice for training (Skimo18 better choice for all around training and racing). The fabric against the back is essentially mesh so it is completely breathable meaning that it helps you stay cool, but anything in the pack will get really sweaty. Not a big deal in a race where you never open it but not good for training. It's also worth noting that the pack will only fit the most minimal race shovels (CAMP Crest). Nothing bigger will fit. Similarly, an 8-fold probe is a must. The ski carry hook comes with a long bungee that almost certainly should be shortened by the user by tying a knot at the anchor point. There are also actually two anchor points that the hook can be girth hitched to. It comes attached to the upper one, but there is also one lower in the bottom corner of the same pocket that I find works a bit better. 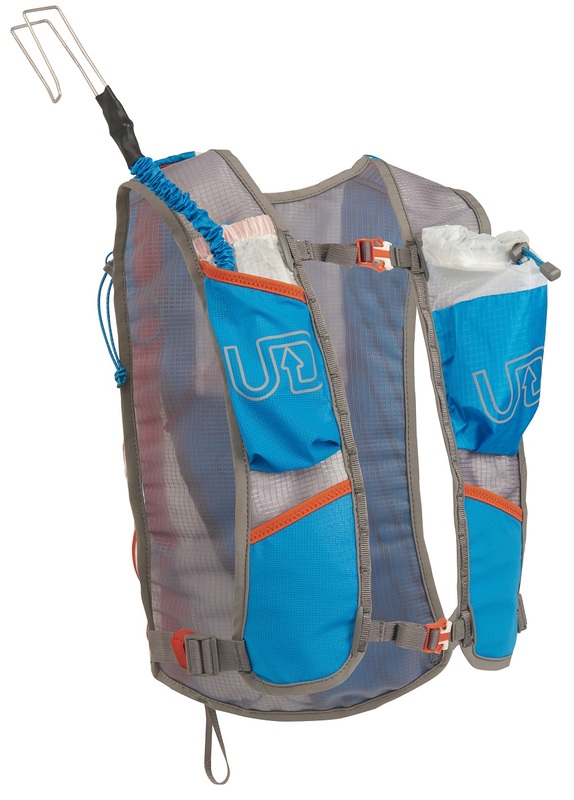 One of the big advantages is the fuel/hydration carry that we are used to from UD running vests. I've found that the soft flasks work way better than a hard bottle in the pockets. It can carry a smaller flask with gel and a larger flask with water no problem. So, all said and done, it is a tweakable pack, specifically for world cup style individual racing to be as light as possible and carry the mandatory equipment.